The Voodoo Boost is the latest in the Voodoo Series of analogue guitar effects and differs from all the other Distortion and Fuzz effects we make in almost every key area of operation. It has been designed expressly to compliment the many various designs of amplifiers in use today and should be used last in the effects chain just before the amplifier. It is not only excels in live situations but also is equally versatile in the recording studio. It controls not only volume boost but also has a fatness control and gain/distortion control to give a truly wide range of operational possibilities. The direct dual drive outputs also make parallel or multi path processing easy without having to buy any other splitter device. The following sections will give some idea of the many ways it can be used. The Voodoo Boost is capable of a significant distortion free volume boost to the amplifiers input at the touch of the footswitch. The fatness control will sets the tone required when this boost is required. Normally if only volume boost is required the gain control is set to minimum and the output level control adjusts the amount of boost. The overall output capability of the unit is sufficient to make the amplifier stages distort severely if required. 1st stage distortion can also be introduced by lowering the amplifiers volume control and raising the Voodoo Boost output level. The output level from guitar pickups is usually not enough to overload the 1st stage significantly so this is a new area to try. 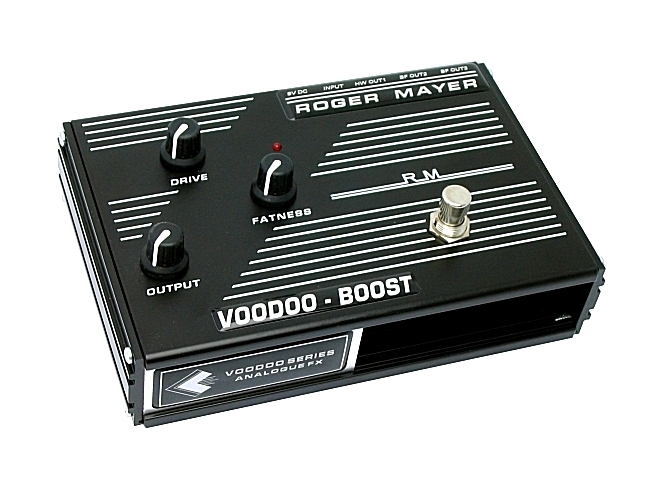 The Voodoo Boost will give a simple classic amp channel switching features. This control does what it says, you dial on fatness of tone. It is not just a simple tone circuit but has been carefully crafted to produce a remarkably wide range of useful amplifier tones. Screaming Tweed Twang to Classic British 4 x12 tones can be emulated with ease. So set your amp to a neutral tone setting and experience the range of tone control provided. There is no overriding nasal tonal quality that plagues so many pedals and the openness of the tone quality is truly amazing. The overall internal gain of the unit can be adjusted to introduce very pleasant internal harmonic distortion which when used in conjunction with the output control unleashes unlimited sonic combinations. Remember to use the bypass frequently to return to your reference point. The amount of gain available should satisfy even the most diehard metal head. There are many sonic possibilities available from mild crunch to absolute overdrive insanity as the various combinations of amp distortion and or Voodoo Boost distortion are experimented with. The Voodoo-Boost is housed in our Standard Style enclosure with both dual direct drive buffered outputs or hard wire output and has a rapid change 9V battery compartment. Extensive internal filtering ensures that noise free operation is maintained even with the most basic of adapters. DUAL DIRECT DRIVE OUTPUTS are provided capable of driving very long leads without any loss and in fact you could use a speaker lead for the outputs if you want without any hum. This feature feature is standard on all our voodoo series and in effect reduces the output lead length to zero. This results in GREATER DETAIL and FIDELITY than using two long lengths of guitar leads in traditional hard wire bypass set-ups. The problem of CABLE NOISE induced by vibration on stage is eliminated together with electrical magnetic interference induced into shielded cables from lighting rigs etc. Possibly of more importance there is no TONE SUCKING at all from the output length of guitar cable. After all the ULTIMATE GUITAR CABLE would have a lead length of zero, and guitar players can detect the difference between long and short cables easily. The overall signal quality in the unit is thus guaranteed right up to amplifier and this overall performance exceeds any other method in use today. When using a Voodoo-Bass as the last device in a signal chain the distance to the amp does not come into consideration and long leads can be used successfully in recording situations e.g. : playing in the control room. TRADITIONAL HARD WIRE OUTPUT /BYPASS is provided as well to enable comparison between using a BUFFERED OUTPUT in your particular set-up. The discussion which one is better is up to you as both possible scenarios are catered for. The Voodoo-Blues has a true hard wire output plus two buffered outputs that can drive long cable lengths with no high frequency loss. These buffered outputs are disconnected when the hard wire output is being used. This means that all performance situations are catered for whether you want a true hard wire output or your situation calls for the advantages of buffered outputs. 150Hrs or more using a premium grade alkaline 9 Volt type. An external AC adapter (not supplied) can be used and access is through a standard DC power jack ( 2.1mm centre pin ) situated next to the jack sockets. Internal onboard filtering ensures that optimum low noise performance is maintained and diode protection provides peace of mind in case of polarity setting mistakes. It uses the standard negative centre pin connection protocol used by many leading manufacturers. 9 volt DC. Regulated output is recommended. Width 170 x Depth 112 x Height 57mm. Weight : 618g with battery.